Entheogens, Enlightenment, and Experimental Humanities with Thomas B. Roberts, Ph.D., Professor Emeritus at Northern Illinois University and Author of Psychoactive Sacramentals. Presented by the Templeton Research Lectureship Program on the Constructive Engagement Between Science and Religion (2005-2008) in Association with the Spirituality, Religion, and Health Interest Group. For questions, please contact 215-614-0332 or go to www.mindreligion.com. Pizza will be provided after the lecture. The Drug War's "Unacceptable Losses"
[This post comes courtesy of Ken Wolski, RN, MPA. He is the executive director of the Coalition for Medical Marijuana -- New Jersey, www.cmmnj.org, [email protected]] "Unacceptable Losses" opened Friday, 1/12/07, at the Woodrow Wilson School's Bernstein Gallery on the Princeton University Campus. This photo-documentary by photgrapher and med student Arthur Robinson Williams examines U.S. drug policy and victims of it. At the exhibit, there are large color and black and white prints that accompany text of interviews that Mr. Williams conducted. The photos Mr. Williams took seemed designed to capture the essential humanity of the subject. (Some of this photographic detail is missing in the web site.) The web site is divided into sections on Treatment on Demand, Sentencing Reform, Syringe Access, Harm Reduction and Medical Marijuana. The stories are very compelling. Though the web site is still a work-in-progess, I highly recommend a look. I was reminded of CMM-NJ member Roberta M., when I read the story of the man with RSD whose pain was so severe he contemplated suicide until he tried marijuana. I consider the War on Drugs the worst policy this country imagined. It combines the worst features of Prohibition and the Vietnam War, in its domestic and foreign components. Lack of medical access to marijuana for legitimate patients is an atrocity in this war. I was one of the first people who was photographed and interviewed by Mr. Williams during his one-year project, though he eventually found more compelling stories for the exhibit and the website. Mr. Williams is looking for additional stories to tell, and he invites submissions via his web site. His web site states: "Although law enforcement is an integral part of the War on Drugs, it is unnecessarily taking resources from effective and complimentary public health strategies. Your stories will form the foundation for that argument." The "Unacceptable Losses" exhibit hopes to tour the country's major universities the way the photo-journalist toured the country collecting subjects for the exhibit. For more, see http://unacceptablelosses.org/. While Afghan President Hamid Karzai was in Washington this week for meetings with President Bush and other officials, and politicians of both parties were calling for increased anti-drug spending in Afghanistan to deal with that country's burgeoning opium crop, a little noticed Senate hearing last week provided a real crash course on a rational drug policy in Afghanistan. In a Senate Foreign Relations Committee hearing on September 21, New York University Professor Barnett Rubin, perhaps the country's leading Afghanistan expert, provided a strong critique of the obsessive focus on crop eradication and even suggested policymakers consider regulating the opium trade. Rubin is most recently the author of Aghanistan: Uncertain Transition from Turmoil to Normalcy, published by the Council on Foreign Relations in March. "On narcotics, I would like -- sometimes when people call for a stronger counternarcotics policy, which I fully endorse, they focus on crop eradication, as if crop eradication were the central point of counternarcotics. I would submit that that is an error. "First, we have to be clear about what is the goal of our counternarcotics policy in Afghanistan. Where does the harm come from? We are not trying to -- or we should not be trying to -- solve the world's problem of drug addiction in Afghanistan. If we, with all our capacity, cannot stop drug addiction in the United States, we are certainly not going to use law enforcement successfully to eliminate half the economy of the poorest and best armed country in the world. "Therefore, we must focus on the real harm which comes from drug money. Now, 80% of the drug money inside Afghanistan, regardless of the 90% of the total income from drugs which goes outside of Afghanistan -- 80% of the drug money inside of Afghanistan is in the hands of traffickers and warlords, not farmers. When we eradicate crops, the price of poppy goes up, and the traffickers who have stocks become richer. Therefore, we should be focusing on the warlords and traffickers, on interdiction and so on, while we are helping the poor farmers. That is also consistent with our political interests of winning the farmers over and isolating those that are against us. "Furthermore, it is a mistake to consider the drug problem in Afghanistan as something that is isolated in the major poppy growing areas. 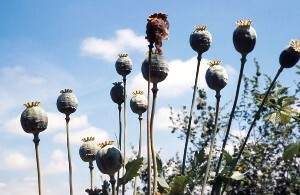 For instance, now there is fighting in Helmand province, which is the major poppy producing area in the world. Because there is fighting going on, it is not possible to implement a counternarcotics strategy in Helmand. 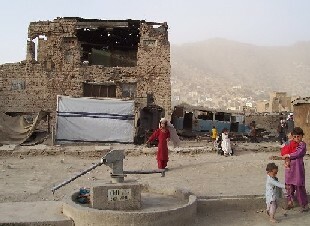 We need to implement rural development throughout Afghanistan, especially in the areas where there is no poppy, in order to show people what is possible and build an alternative economy." Well, I perhaps should have said the developed world. I believe actually the bulk of the narcotics produced in Afghanistan are consumed in Iran and Pakistan. OK. So that's why the Iranians are so interested in making sure it stops. That's in physical quantity. The biggest market in money is in Europe and of course in the United States. If I may add, if you don't mind my mentioning something that I heard in the other house yesterday, Dr. Paul, a Republican from Texas, mentioned at the hearing yesterday that in his view we had failed to learn the lessons of prohibition, which, of course, provided the start-up capital for organized crime in the United States, and that, in effect, by turning drug use into a crime, we are funding organized crime and insurgency around the world. And it may be that we need to look at other methods of regulation and treatment. Well, they're closer. Basically, the cost of production is a negligible portion of the price of narcotics. No, no. It's risk because it's illegal. If it were not illegal, it would be worth hardly anything. It's only its illegality that makes it so valuable. Another fascinating topic. (LAUGHTER) Well, we thank you again for your help (inaudible). The hearing is adjourned." Another fascinating topic, indeed. At least someone is trying to educate our elected officials about the economic and political consequences of drug prohibition -- in Afghanistan, anyway.